“Just wait…” | Who Needs a Nap? My friend recently made me uber-aware of a uniquely annoying type of person; she’s (unfortunately, usually a woman) someone who manages to be dismissive and condescending at the same time, with impressive brevity. In fact, she uses only two simple words to convey her superiority and scorn. I’m sure you’ve all met her. In fact, as much as I hate to admit it, we have all probably, at one point or another, BEEN her. It’s the incorrigible “Just Wait…” mom/woman/person. She’s the woman who simply cannot resist telling you that even though you think things are bad, they’re actually about to get a whole helluva lot worse. Actually, come to think of it… the “Just Wait” woman has been around my entire life. 1. She’s a know-it-all. She has already lived through every experience you can possibly imagine. Seriously, test her. She’s done it and back then, it was HARDER. 3. And most importantly, she’s always implying that THINGS ARE ONLY GOING TO GET WORSE. She is (metaphorically speaking, of course) extinguishing the light at the end of my tunnel! But then, BLAMMO, there she is, telling me to “Just wait…” because apparently the next phase is when he tries to break Lego bricks over the Happy Dude’s head and that’s when things get REALLY crazy! Think you’ve got problems now? Just wait until they’re all in different sports and you need to be in six places at the same time! Just wait until they becomes ‘tweens and the real attitudes appear! Just wait until they start liking boys/girls! Just wait until they want body piercings! Just wait until they start drinking and driving and texting and Tweeting and FBing! Just wait until they go to college and you can’t see them anymore! Just wait until they get a job and you can’t call them every minute! Just wait until they get married and you become an annoying mother-in-law (hell to the yeah)! Just wait… Just wait… Just wait! ALL OF THAT STUFF ALREADY SCARES THE S**T OUT OF ME. Please don’t remind me about the parenting nightmares I have in store. I’m just trying to deal with the ones I have right now and you telling me to “Just wait…” only makes me feel like throwing in the towel. Or drinking before noon. It minimizes my current struggles and dammit, my struggles are REAL! 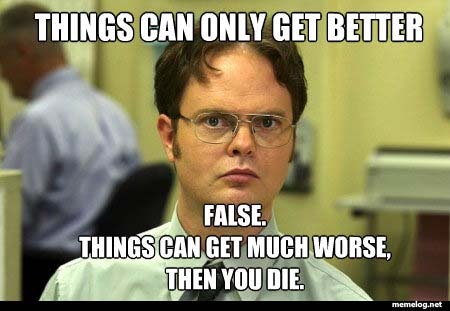 Dwight’s a “Just wait…” guy. No surprise there. Alas, I was disappointed. However, maybe you can break that out so that I can hear how KJ lays down the law and rules the house with an iron fist. Pingback: Little People, VERY VALID Problems « Who Needs a Nap? Wait. Am I the “just wait” lady? Man, I hope that’s not me!